Megan is one of those amazing people you are grateful to have met. She’s an incredibly intelligent, funny, and caring individual, with a contagious laugh and an exceptional work ethic. In April 2004 Megan’s grandmother recommended The Movement Centre of Manitoba to her parents. Megan was almost 4 years old at the time and had been diagnosed with cerebral palsy. Her mom and dad, Paula and Joe, felt Conductive Education rehabilitation would be an excellent compliment to the therapies she was already doing. They had no idea what a difference Conductive Education, and The Movement Centre, would make in Megan’s life. 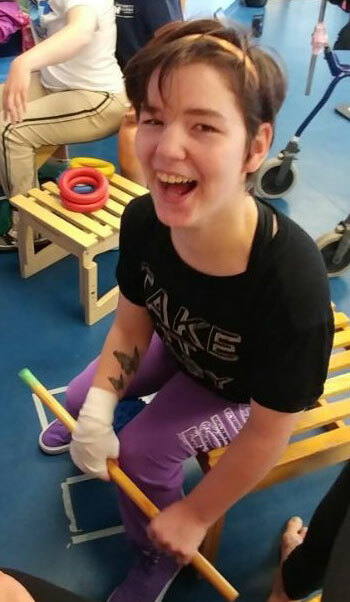 Megan had very limited mobility when she started her classes at The Movement Centre; her core was extremely weak and she wasn’t able to sit independently, she had marginal use of her left hand, and she couldn’t weight bear. Over the years the Conductive Education rehabilitation Megan has received at The Movement Centre combined with her focus, her dedication, and her determination to be “more than her wheelchair” as her dad Joe says, have helped her to address many of the challenges she had when she first started her sessions here. “Her personality really came out,” Joe said about how her strong work ethic was built by coming to The Movement Centre. Amongst other accomplishments, Megan can now use both hands almost equally, weight bear, walk in a walker, and sit on her own. All these achievements have helped Megan’s journey towards independence. Some of Megan’s current goals are walking and weight bearing for longer stretches of time. Megan is proud of her many triumphs, in and out of The Movement Centre. She will graduate high school with her peers in 2018, and is eager to start her university education in disability services. She’s looking forward to entering the workforce. 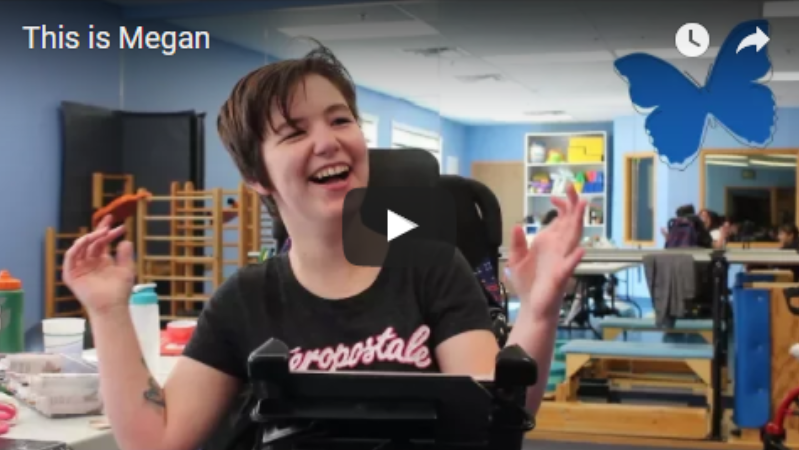 With your help, Megan, and others like her, will continue to gain confidence, mobility and independence through Conductive Education rehabilitation at The Movement Centre. You can hear all about Megan’s accomplishments from Megan herself by watching the video below. However, have a tissue handy. You’ll need it.